A horse’s position within the herd is not determined by its age, race, or body size. 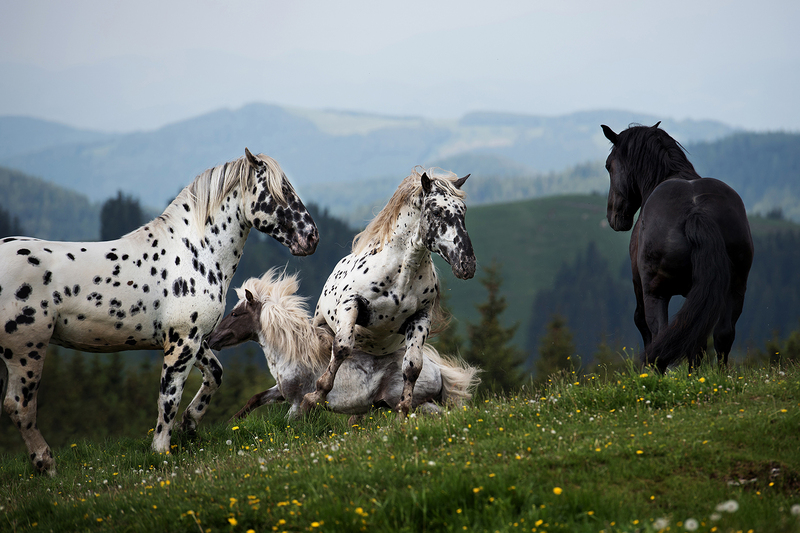 One horse might behave in one way in a certain environment, and the same horse might act in a completely different manner when put into the constellation of another group. In general, feelings of mutual liking decide between friendship and aversion; this is even truer among stallions. So, the first encounter between two stallions is a good moment to observe behavioral strategies that are based in the beings’ personalities, and to draw conclusions about each of the stallions’ ego and self-image. When different stallions meet each other at the mountain pasture “Sommeralm” quite distinct and sometimes opposing characters collide. 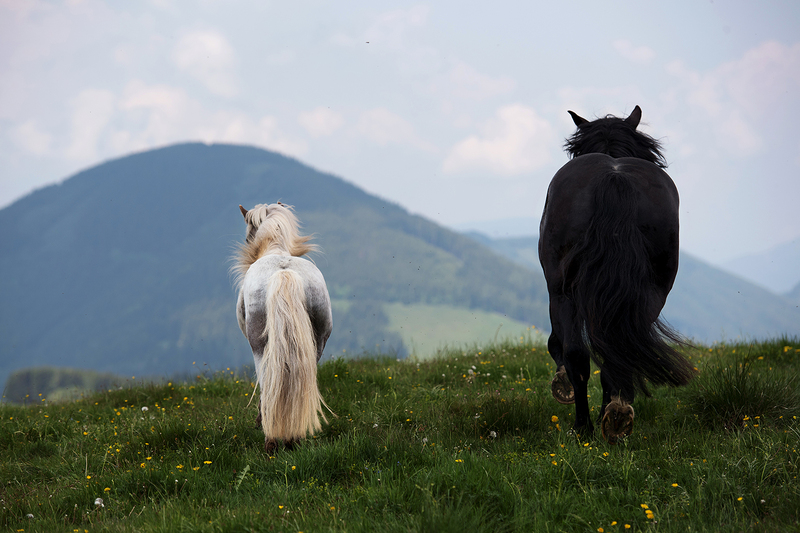 Furthermore, the animals interact with their very own mentality and size here; this can be seen in the photo pictures when an impressive Noriker breeding stallion clashes with a courageous Shetland pony stallion. The tiny stallion is literally run over, and ends up under the giant leopard spotted belly as can be seen in the picture. Of course, there is a huge risk that one participant gets hurt when such distinct characters meet, and every horse owner should probably think about the right composition of the group so to ensure an equal distribution of physical strength in order to minimize the risk. The experience of being run over does not prevent the tiny Shetland stallion from muscling in, and he strikes an attitude prancing parallel to the impressive black Noriker stallion. This highly elevated and extremely powerful parallel trot or parallel prancing serves to demonstrate mental power; the stallions present themselves trotting side to side in a slower but more cadenced way than usual. Opponents frequently match the sequence of their steps, and present the curvature of their arched necks. Personality and inner strength are not fixed attributes, and we cannot simply read them from the outside of a horse’s body. Our horses adopt roles similar to the way we human beings take on distinct roles according to specific situations, possible opponents and flirt partners, our current state of mind, one’s own personal positive and negative previous experiences, and, and, and. The small Shetland pony stallion likely overestimated his physical strength quite profoundly in this show off scene; his subjective self-image, however, appears to be intact and apparently outshines the “small” backlash he experienced when confronting the giant. We can only vaguely guess the self-image our horse has created of itself deep within; but we can maximize our chances to sneak a peek at this hidden personality if we allow our horse the freedom to openly express its personality. This means that our horse is allowed to introduce ideas into training, it is also allowed to have social interactions with its environment, and to satisfy its curiosity. So, the key to horse personality development is openness and reduced control; we can consider ourselves lucky to be allowed to observe this personal development.